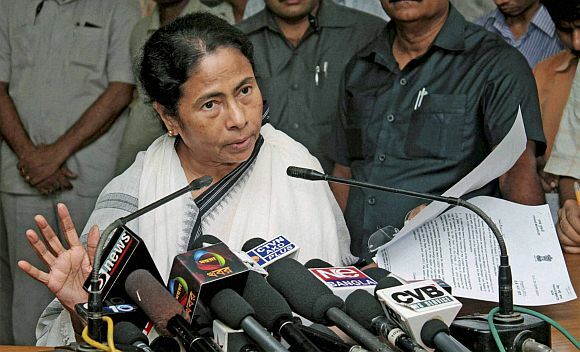 West Bengal Chief Minister Mamata Banerjee on Saturday wrote to the Election Commission protesting transfers of four IPS officers, including Kolkata and Bidhannagar police commissioners. The EC decision is "unfortunate", "highly arbitrary, motivated and biased" and taken at the behest of Bharatiya Janata Party, the letter said, urging the poll panel to review its decision. "Should there be any deterioration in the law order situation of the state, would the Commission take responsibility?" said the letter. It also asked the EC to initiate a probe as to how and under whose guidance the decision on the transfer of the top police officers was taken. "I strongly feel that the EC plays a neutral role to save democracy in India. But, it is very unfortunate that I have to write this letter today to raise strong protest against the transfer order dated April 5, 2019 issued by the EC by way of removing four senior officers from their existing positions," Banerjee said in her letter. Banerjee alleged that the EC transfer orders came soon after Prime Minister Narendra Modi and a BJP candidate alleged in a TV programme that the law and order situation in West Bengal is bad. Rajesh Kumar, Additional Director General of Police, Pollution Control Board, was made the new Kolkata top cop, while Natarajan Ramesh Babu, ADG and IGP, Operations, was named the Bidhannagar police commissioner. The poll body also named Avannu Ravindranath, deputy commissioner (Airport Division) of Bidhannagar, as the new Birbhum superintendent of police and appointed Srihari Pandey, deputy commissioner of Kolkata Armed Police, 3rd Battalion, as the Diamond Harbour police superintendent. The announcement comes days after opposition parties in the state had alleged that free and fair elections would not be possible under these officers. "The flow of events gives rise to strong doubts whether the Commission is functioning as per its constitutional mandate of conducting free and fair elections or working in a manner to appease the ruling BJP at the centre," the letter said. Describing Sharma and Singh as "bright and experienced", she said they had played key roles in the seizure of illegal currency, gold, liquor and other prohibited items and in enforcing law and order in strict manner. "The decision of the ECI to remove these officers leaves a big question mark whether this step is to give a shield to the vested interested parties and their political masters," Banerjee's letter said. She said those brought in place of the two top police officers had been given the duty of police observers in other states and have little idea about Kolkata and Bidhannagar. Stating that law and order is a state subject, Banerjee alleged that the state government was not consulted on the transfer. "By not following the established practice and not seeking a panel of officers from the state government, the action of the ECI is prima facie undemocratic, biased and suffers from principles of natural justice," she wrote. The EC had written to Chief Secretary Malay De directing immediate implementation of the transfers and sought a compliance report within 24 hours. It also directed that the police officers who have been transferred should not be involved by the state government in any election-related duty. Both Sharma and Singh were present when Banerjee began her sit-in on February 3 to protest against CBI's attempts to question former police commissioner Rajeev Kumar in connection with its probe into the Saradha scam. Kumar was later interrogated by the CBI in Shillong under the orders of the Supreme Court and Sharma had replaced Kumar. After TMC MP Abhishek Banerjee's wife was allegedly found carrying gold at the Kolkata airport, BJP had lodged a complaint with the EC against Bidhannagar Police commissioner Gyanwant Singh. The party had demanded that Singh be held responsible for the alleged police interference if "prima facie any such incident happened".